I probably shouldn’t share this excerpt from The Etiquette of Courtship and Matrimony: with a Complete Guide to the Forms of a Wedding, published in 1852. I should hoard the information to help me write my great comic farce masterpiece that will be titled The Marriage of Inconvenience and Vexation. But I shall be generous with the information and post it here with images from Le Conseiller Des Dames Et Des Demoiselles. Enjoy! THE ETIQUETTE OF THE WEDDING. FIXING THE DAY, AND ITS CONSEQUENCES. 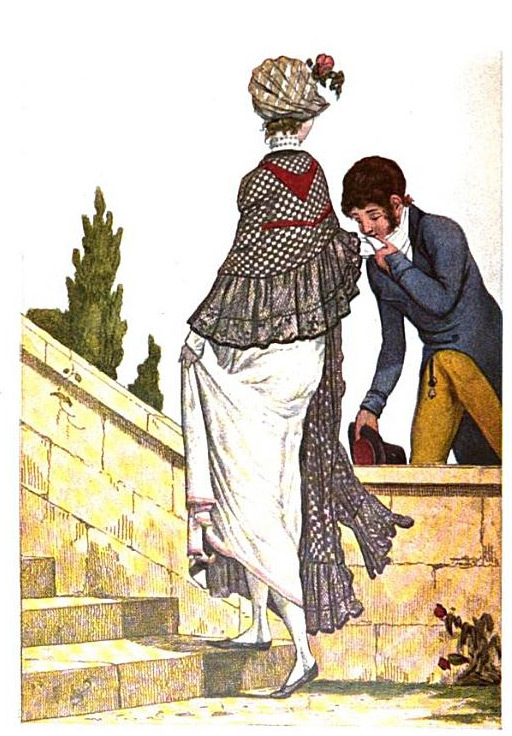 WHEN the course of true love has run smooth for a brief or a long period, as the circumstances of the case may require, the fulness of time will arrive for “FIXING THE DAY.” It is the gentleman’s province to press his suit for the earliest possible opportunity, but it is the lady’s express privilege to fix the exact day. Strange as it may seem, it is necessary for the gentleman to act deliberately on this occasion—having first considered where it will be convenient to spend the honeymoon—inasmuch as this will depend on the season of the wedding. No one would spend a winter-honeymoon in the country, or make a summer bridal-excursion to Paris. THESE are matters that must be attended to where there is property on either side; and it behoves the intending bridegroom to take care there is no delay. An attorney may be hurried at the last moment, and Heaven have pity on the poor clerks who have to engross the deeds ; but the counsel on both sides have no care for either party, and read over a marriage-settlement with as much deliberation, and make as many perplexing objections, as if it were the lease of a house in Crutched Friars, or as if the Hon. 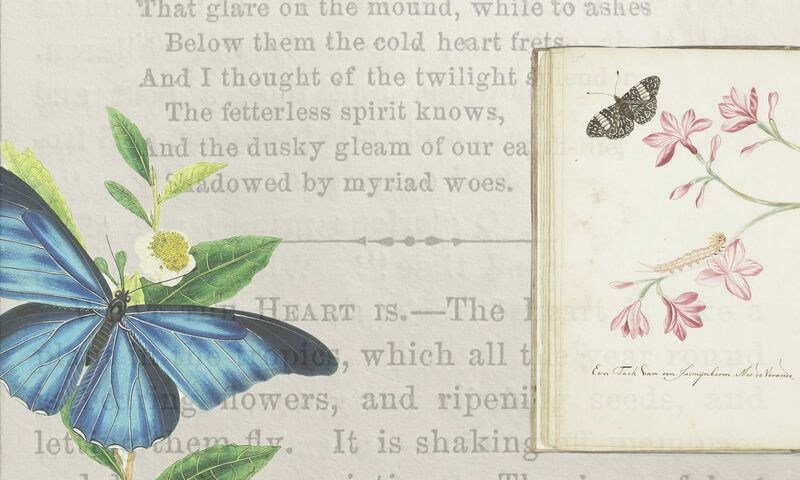 Charles John Mountjoy Elphinstone Stuart were making, upon parchment, a perpetual declaration of war against the person and interests, in futuro and in perpetuum, of the Lady Valentine De Courcy Montrevor. An occasional morning call in the square of Lincoln’s Inn, at this period, is recommended as a necessary, though disagreeable variety with the evening visit in that of Belgravia. On the business part of this matter, it is not the privilege of our work to dilate, but we may be permitted to suggest that two-thirds of the lady’s property should invariably be settled on herself; and that where the bridegroom has no property wherewith to endow his wife, beyond his professional prospects, it should be made a sine qua non that he should insure his life in her favour previous to marriage. BY this time the gentleman will have made up his mind in what particular method he will be married—a matter, however, which is generally settled for him by his position in life, or his means. He has, indeed, his choice, to a certain extent, of marriage by banns, by licence, by special licence, or before the Registrar; but woe betide the unlucky wight who proposes the last method, either to a young lady or her parents : let him be careful to do so on the ground-floor. FOR this purpose, notice must be given to the clerk of the parish, or of the district church. The names of the two parties must be written down in full, with their conditions, and the parishes in which they reside—as, “Between Nicholas Rowe, of the parish of St. Ann‘s, bachelor (or widower, as the case may be), and Mary Bone, of the parish of St. Ann’s, spinster (or widow, as the case may be).” No mention of the lady or gentleman’s age is required. Where the lady and gentleman are of different parishes, the banns must be published in each, and a certificate of their publication in the one furnished to the clergyman who may marry the parties in the church of the other parish. The banns must be publicly read on three Sundays in the church, after which, on the Monday following, if they so choose, the happy pair may be “made one.” It is usual to give a notice of one day previous to the clerk, but this is not legally necessary, —-it being the care of the Church, as well as the province of the Law, to throw as few impediments as possible in the way of marriage, of which the one main fact of a consent to live together, declared publicly before relatives, friends, and neighbours, assembled together (and afterwards, as it were by legal deduction, before witnesses), is the sole, whole, essential, and constituent element. Marriage by banns, except in the country districts, is usually confined to the humbler classes of society. This is to be regretted, inasmuch as it is a more deliberate and solemn declaration, and leaves the ceremony less open to suddenness, contrivance, or fraud. A marriage by banns, it is understood, can never be set aside by the after discovery of deception or concealment (as of residence, or even names) on either side. The fees of a marriage by banns vary from eleven shillings and sixpence to thirteen shillings and sixpence and fifteen shillings and sixpence, according to the parish or district where the marriage may take place. HOURS IN WHICH MARRIAGES MAY BE CELEBRATED. BY the Statute of 23 Hen. VIII., the Archbishop of Canterbury has power to grant Special Licences; but in a certain sense these are limited. His Grace restricts his authority to Peers and Peeresses in their own right, to their sons and daughters, to Dowager Peeresses, to Privy Councillors, to Judges of the Courts at Westminster, to Baronets and Knights, and to Members of Parliament ; and by an order of a former Prelate, to no other person is a special licence to be given, unless they allege very strong and weighty reasons for such indulgence, arising from particular circumstances of the case, and they must prove the truth of the same to the satisfaction of the Archbishop. The application for a special licence is to be made to his Grace through the proctor of the parties, who, having first ascertained names and particulars, will wait upon his Grace for his fiat. The expense of a special licence is about twenty-eight or thirty guineas—whereas that of an ordinary licence is but two guineas and a half; or three guineas where the gentleman or lady are minors. AN ordinary Marriage Licence is to be obtained at the Faculty Registry, or Vicar-General’s Office, or Diocesan Registry Office of the Archbishops or Bishops, either in the country, or at Doctors’ Commons, or by applying to a proctor. A licence from Doctors’ Commons, unlike others, however, is available throughout the whole of England. As a saving of trouble and expense may be an object, a hint upon this point, as given by Mr. Charles Dickens, in one of his publications, may be perhaps useful to persons attending Doctors’ Commons, and at the same time guard them against the annoyances and impositions of touters in that neighbourhood. Grace and Health—WHEREAS ye are, as it is alleged, resolved to proceed to the solemnization of true and lawful matrimony, and that you greatly desire that the same may be solemnized in the face of the Church: We being willing that these your honest desires may the more speedily obtain a due effect, and to the end therefore that this marriage may be publicly and lawfully solemnized in the church of by the Rector, Vicar, or Curate thereof, without the publication or proclamation of the bans of matrimony, provided there shall appear no impediment of kindred or alliance, or of any other lawful cause, nor any suit commenced in any Ecclesiastical Court, to bar or hinder the proceeding of the said matrimony, according to the tenor of this licence: And likewise, That the celebration of this marriage be had and done publicly in , the aforesaid church , between the hours of eight and twelve in the forenoon. 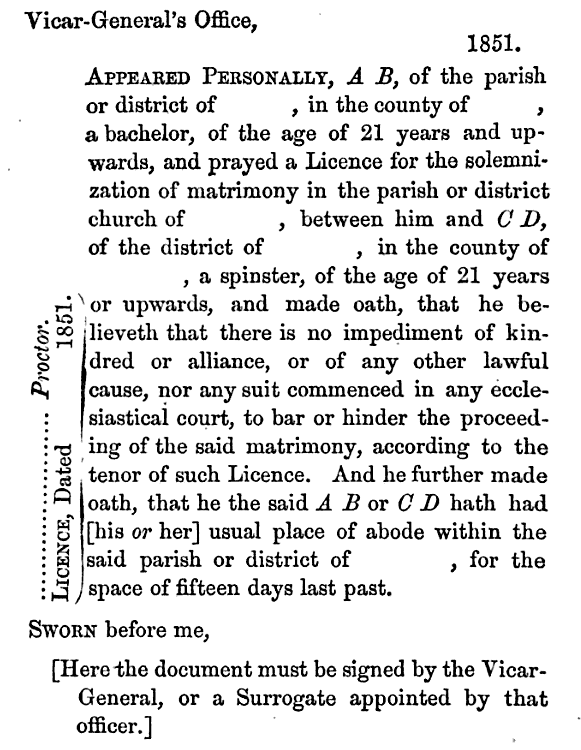 We, for lawful causes, graciously grant this our LICENCE AND FACULTY, as well to you the parties contracting, as to the Rector, Vicar, Curate, or Minister, of , the aforesaid , who is designed to solemnize the marriage between you, in the manner and form above specified, according to the rites of the Book of Common Prayer, set forth for that purpose, by the authority of Parliament. Given under the seal of our VICAR- GENERAL, this day of , in the Year of Our Lord one thousand eight hundred and fifty-one, and in the fourth year of our translation. CONSENTS IN CASE OF MINORS. By and with the consent of A B, the natural and lawful father of B B, the minor aforesaid. By and with the consent of A B, the guardian of the person of the said C D, the minor aforesaid, lawfully appointed in and by the last will and testament of D D, deceased, his [or her] natural and lawful father. By and with the consent of A B, the natural and lawful mother of B B, the minor aforesaid, his [or her] father being dead, and he [or she] having no guardian of his [or her] person lawfully appointed. and his [or her] said mother being unmarried. Guardian appointed by the Court of Chancery. By and with the consent of A .B, the guardian of the person of the said C D, appointed by the High Court of Chancery, and having authority to consent to his [or her] marriage, his [or her] father being dead, and he [or she] having no guardian of his [or her] person, otherwise lawfully appointed, or mother living and unmarried. No Father, Testamentary Guardian, Mother, or Guardian appointed by the Court of Chancery. That he [or she] the said A B, hath no father living, or guardian of his [or her] person, lawfully appointed, or mother living and unmarried, or guardian of his [or her] person appointed by the High Court of Chancery, and having authority to consent to the aforesaid marriage. The previous remarks have reference only to licences for marriages about to be solemnized according to the laws of the Church of England. MARRIAGE OF ROMAN—CATHOLICS OR DISSENTERS BY LICENCE. BY the Statute 6 and 7 William IV., 17 Aug. 1836, Roman-catholics and Dissenters who may wish to be married in a church or chapel belonging to their own denomination, can obtain a licence for that purpose from the Superintendent Registrar of the district in which one of the parties reside, after giving notice thereof a week previous to the same officer: the expense of the licence is 3l. 12s. 6d. SHOULD the parties wish to avoid the expense of a licence, they can do so by giving three weeks’ notice to the same officcer,—which notice is affixed in his office, and read before the proper officers when assembled,——at the expiration of that time, then the marriage may be solemnized in any place which is licensed, within their district. The Registrar of Marriages of such district must have notice of, and attend every such marriage. The fee due to the Registrar of Marriages for attending the ceremony, and registering the marriage (by licence) is 10s., and for certificate 2s. 6d,; and without a licence 5.s., and certificate 2s. 6d. It is highly to the credit of the Christian people of this country, and an eminent proof of their deep religious feeling—that all classes of the community whatsoever have virtually repudiated these “Marriages by Act of Parliament ;” nor would we advise any fair maiden who has a regard to the comfort and respect of her after-connubial life, to “ show her spirit,” by being married in the Registrar’s back-parlour, after due proclamation by the Overseers and Poor-Law Guardians. THE BRIDAL TROUSSEAU, AND THE WEDDING PRESENTS. THE day being fixed for the wedding, the bride’s father now presents her with a sum of money for her trousseau, according to her rank in life. 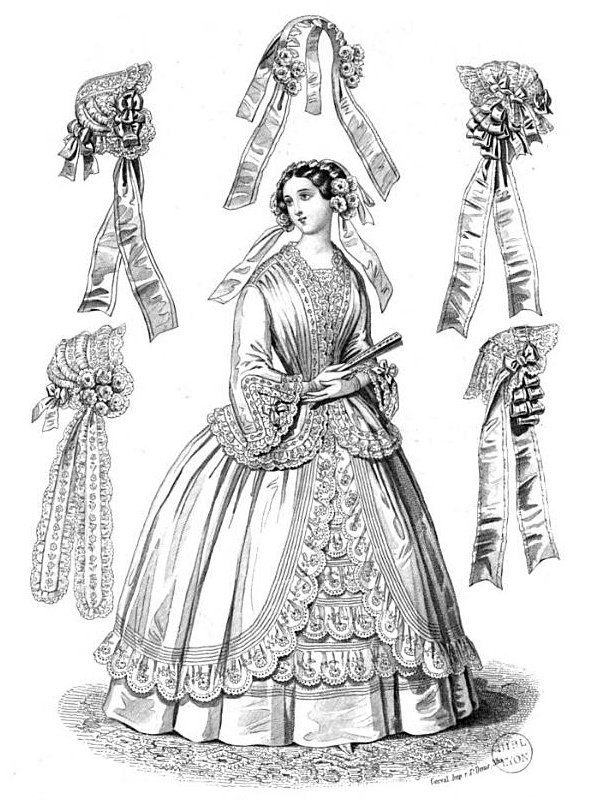 A few days previous to the wedding, the wedding presents are also made by relations and intimate friends, varying in amount and value according to their degrees of relationship and friendship—such as plate, furniture, jewellery, and articles of ornament, as well as of utility to the newly-married lady in her future station. DUTY OF AN INTENDED BRIDEGROOM. THE bridegroom, now, at last, must come out of the bright halo of his happiness, into the cold, grey, actual daylight of the world of business. He must look after the house which he intends for his future home. He must, also, if engaged in business avocations, make arrangements for a month’s absence ; in fact, bring together all matters into a focus, so as to be immediately and readily manageable when he becomes once more grave enough to take the reins himself. He must also burn all his bachelor letters, and part with, it may be, some few of his bachelor connexions,—bid a long farewell to all bachelor friends, and generally communicate, as it were en passant, to all his acquaintances, the close approach of so important a change in his condition. Not to do this might hereafter lead to inconvenience. Many an illustration, both humorous and painful, of the dilemmas of the bachelor-husband, presses upon our pen; but the mere suggestion will waken up in the minds of our married readers—if such there be—many a strange scene of the comedy of life. We must, however, proceed to matters of more immediate interest, for we are now in the very whirl and vortex of a wedding. BUYING THE RING, AND ITS CONSEQUENCES. IT is the gentleman’s business to buy the ring—and he must be sure not to forget it. Such things have happened. The ring should be, we need not say, of the very purest gold, but very thick—a return to the old fashion of the common people. 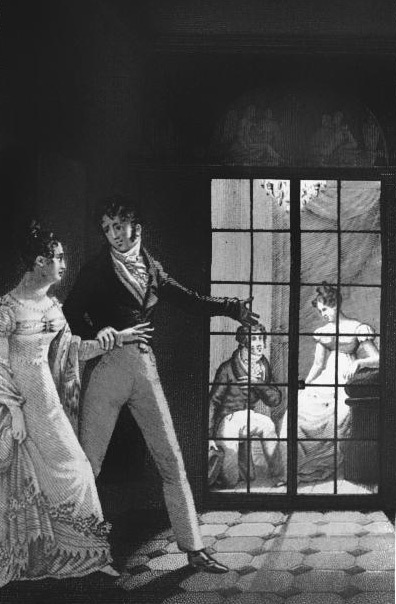 There are three reasons for this ; first, that it may not break— a source of great trouble to the young wife ; secondly, that it may not slip off the finger without being missed—few husbands being pleased to hear that their wives have lost their wedding rings; and thirdly, that it may last out the life-time of the loving recipient, even should that life be protracted to the extreme extent. To get at the right size required, is a pretty part of the delicate mysteries of young love ; but should the youth be too modest, or accident have intervened, a not unusual method is to get a sister of your fair one to lend you one of the lady’s rings. By this, the jeweller will select the proper size. Take care it be not too large. Some audacious individuals, rendered hold by their favoured position, have been even known presumptuously to try the ring on the patient finger of the much enduring fair one; and, curiously enough, it has never yet happened that the ring has been refused, or sent back to be changed. We remember a singular coincidence in an Irish young gentleman of fashion, who was so easily pleased, as never to return a new coat to his tailor to be altered, for fear it should not come back again. Having bought the ring—which he will receive wrapt up in a piece of silver paper—the young lover must now put it into the left-hand corner of his right-hand waistcoat-pocket (there is a reason for this direction), and never part with it until he takes it out in the church, during the wedding ceremony, except on an occasion to be shortly mentioned, when he must entrust it to the keeping of the bridesmaid. In ancient days it appears, by the “ Salisbury Manual,” that there was a form of “ Blessing the Wedding Ring,” previous to the wedding day ; and in those times the priest, previous to the ring being put on, always made careful inquiry whether it had been duly blessed? It would seem to be the wish of certain clergymen, who have of late brought back into use many ceremonial Observances that had fallen into desuetude, to revive this ancient custom. WHO IS TO BE ASKED TO THE WEDDING. THE wedding should take place at the house of the bride’s parents or guardians. The parties who must be asked, are the father and mother of the gentleman, the brothers and sisters (their wives and husbands also, if married), and the immediate relations and favoured friends of both parties. Old family friends on the bride’s side should also receive invitations,—the rationale, or original intention of this wedding assemblage, being to give publicity to the fact, that the bride is leaving her paternal home with the consent and approbation of her parents. On this occasion, the bridegroom has the privilege of asking any friends he may choose to the wedding, but no friend has a right to feel affronted at not being invited, since, were all the friends on either side assembled, the wedding breakfast would be a crowded reception, rather than an impressive ceremonial. It is, however, considered a matter of friendly attention in those who cannot be invited, to be present at the ceremony in the church. THE bridesmaids are usually the unmarried sisters of the bride; but it is an anomaly for an elder sister to perform this function. 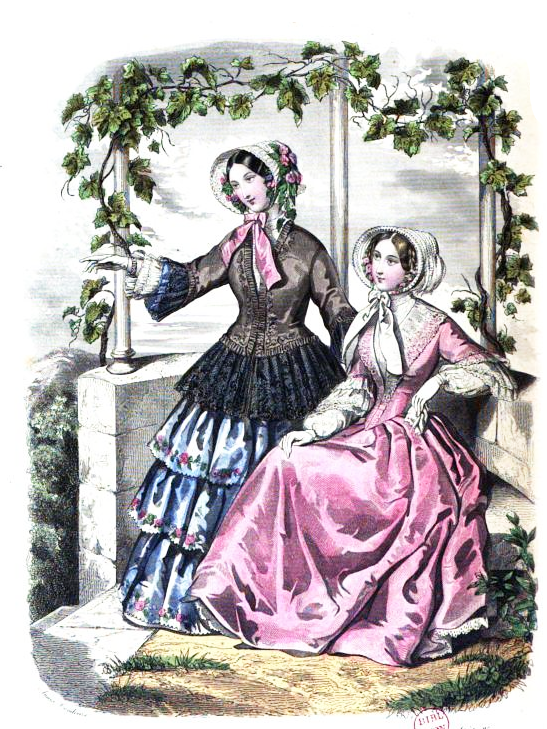 The pleasing novelty in late years, of an addition to the number of bridesmaids,—varying from two to eight and sometimes sixteen,——has added greatly to the interest of weddings, the bride being thus enabled to diffuse a portion of her own happiness amongst the intimate friends of her young heart’s choosing. One lady is always appointed principal bridesmaid, and has the bride in her charge ; it is also her duty to take care that the other bridesmaids have the wedding favours in readiness. 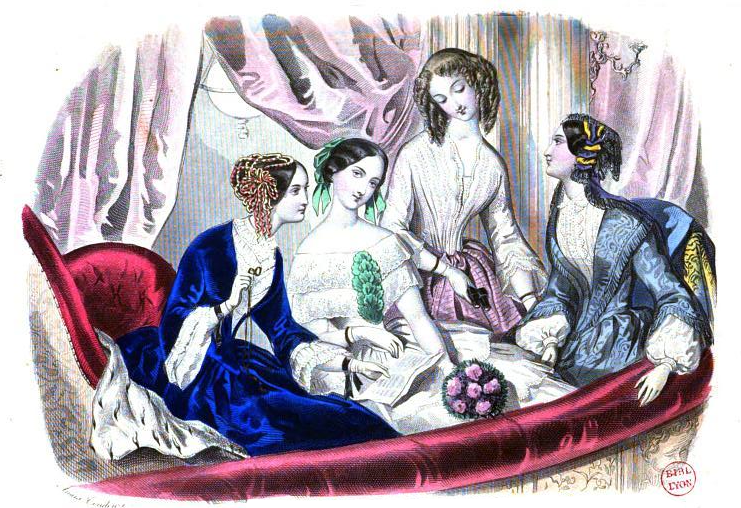 On the second bridesmaid devolves, with her principal, the duty of sending out the cards; and on the third bridesmaid, in conjunction with the remaining beauties of her choir, the onerous office of attending to certain ministrations and mysteries connected with the wedding cake. It behoves a bridegroom to be exceedingly particular in the selection of the friends who, as his bridegroomsmen, are to be his companions and assistants throughout his wedding day. Their number is limited to that of the bridesmaids, one for each. It is unnecessary to say that very much of the pleasure of the day, except to the two parties mainly concerned, will depend on their proper mating. Young and unmarried they must be, handsome they should be, good humoured they cannot fail to be, and well dressed they ought to be. Let the bridegroom diligently examine his store of friends, and select the “prettiest” and the pleasantest fellows for his own train. The principal bridegroomsman has, for the day, a special charge of the bridegroom, and the last warning we would give him is, to take care that, when the bridegroom puts on his wedding waistcoat, he does not omit to take the wedding-ring out of the pocket of the one which he donned on the previous night, and to put it into the left-hand corner of the right-hand pocket. The dress of a bridegroomsman should be light and elegant; a dress coat should be worn. THE bride now sends white gloves, wrapped in white paper and tied with white ribbon, to each of the bridesmaids. The bridegroom does the same to each of the bridegroomsmen. One portion of wedding cake is cut into small oblong pieces, and passed by the bridesmaids through the wedding ring, which is delivered into their charge for this purpose. The pieces of cake are afterwards put up in ornamental paper, generally pink or white enamelled, and tied with bows of silvered paper. The bridegroomsman on this day takes care that due notice has been sent to the clerk of the parish where the ceremony is to take place, so that the church may be got ready, and the clergyman be in attendance. The bridegroomsman should also now make arrangements for the bells being rung after the ceremony, the sentiment of this being that it is the husband that must call on all the neighbours to rejoice with him on his receiving his wife, and not the lady’s father on her going from his house. The bridegroom furnishes to the bridesmaids his list for “The Cards” to he sent to his friends; of which hereafter. On the evening of this day the wedding breakfast should be ornamented and spread out, as far as possible, in the principal apartment. The bridesmaids on this evening also prepare the wedding favours, which are put up in a box ready to be conveyed to the church in the morning. In the first carriage, the principal bridesmaid and bridegroomsman. 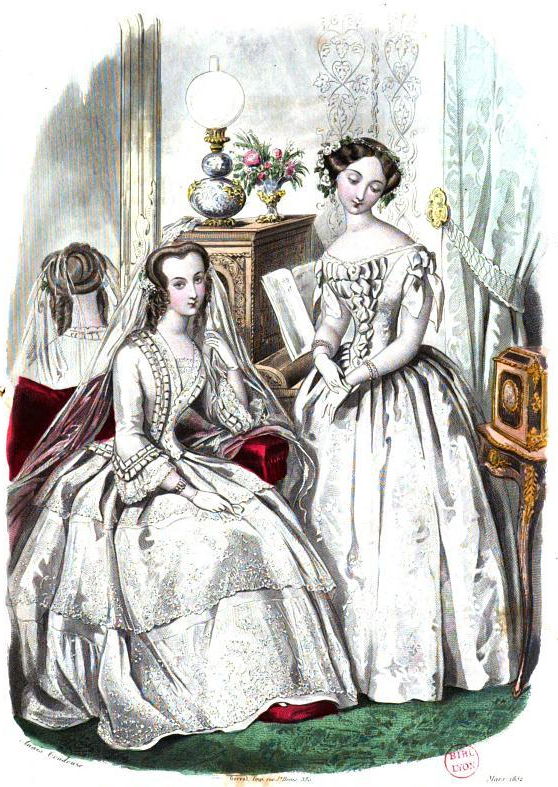 In the second carriage, the second bridesmaid and the bridegroom‘s mother. Other carriages with bridesmaids and friends, the carriages of the bridesmaids taking precedence. In the last carriage the bride and her father. HOW THE BRIDE SHOULD BE DRESSED. A BRIDE’S costume should be white, or as close as possible to it. Fawn colour, grey, and lavender are entirely out of fashion. 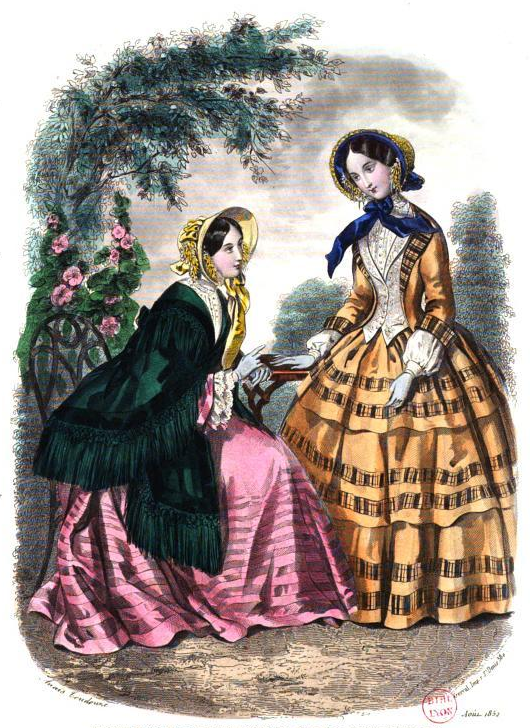 It is considered more stylish to go without a bonnet, wearing a wreath of orange blossoms and a Chantilly veil. 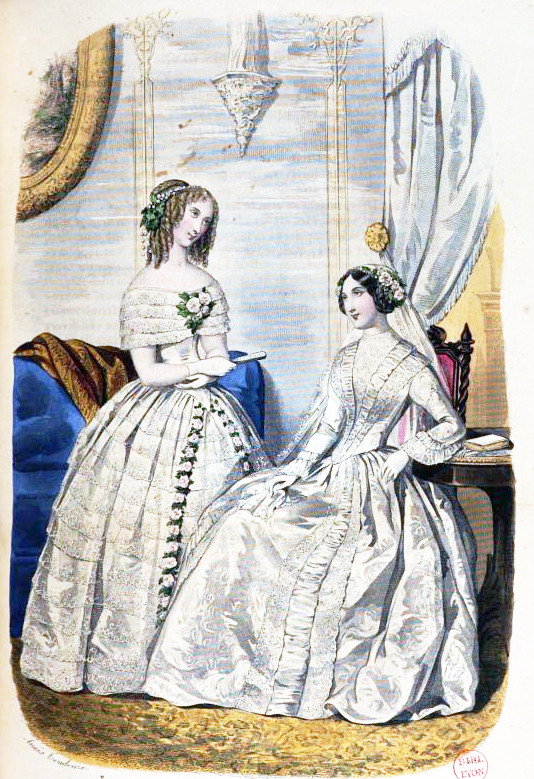 This, however, is entirely a matter of taste, but whether or not wearing a bonnet, the bride must always wear a veil. HOW THE BRIDEGROOM SHOULD BE DRESSED. IT is no longer in good taste for a gentleman to be married in a black coat ; a blue coat, light grey trousers, white satin or silk waistcoat, ornamental tie, and white (not primrose-coloured) gloves, form the usual costume of a bridegroom according to present usage. HOW THE BRIDESMAIDS SHOULD BE DRESSED. THE bridesmaids dress generally in pairs, each two alike, but sometimes all wear a similar costume. Pink and light blue, with white pardessus or mantelets, or white, with pink or blue, are admissible colours. The bonnets, of course, must be white, in which marabout feathers may be worn. 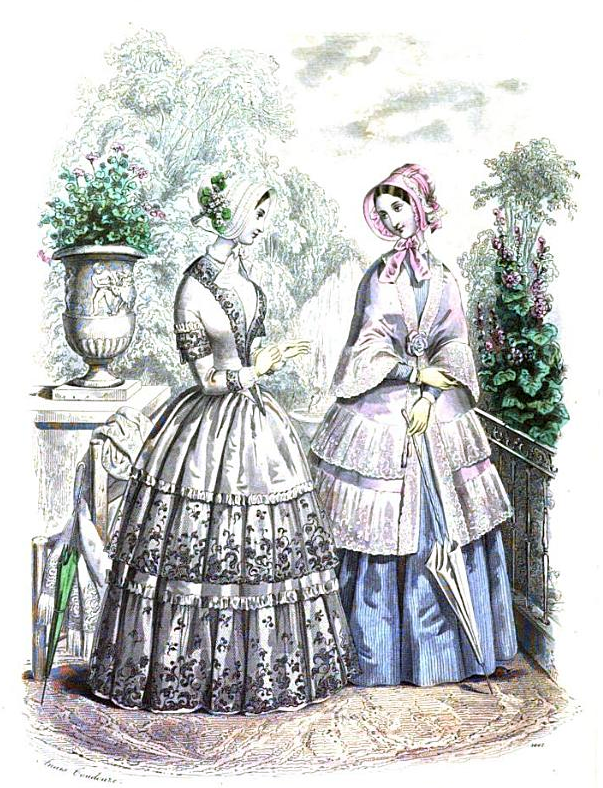 The whole costume of a bridesmaid should have a very light effect, and the tout ensemble of this fair bevy should be constituted in style and colour so as to look well by the side of and about the bride. It should be as the depth of colouring in the background of a sun-lit picture, helping to throw into the foreground the dress of the bride, and make her prominent, as the principal person in the tableau. THE bridegroom receives the bride in the vestry, where he must take care to have arrived some time previously to the hour appointed. THE PROCESSION TO THE ALTAR. THE father of the bride generally advances with her from the vestry to the altar, followed immediately by the bridesmaids. The father of the bridegroom, if present, gives his arm to the bride’s mother if she be present, as is now usual at fashionable weddings, and goes next to the bridesmaids. The friends who have come with the wedding party proceed next in succession. The bridegroom with his bridegroomsmen are in readiness to meet the bride at the altar, the bridegroom standing at the left hand of the clergyman, in the centre before the altar rails. The father, and the mother of the bride, if present, or if she be not, the mother of the gentleman, if present, as she should be, or if she be not there, one of the oldest female relations or most distinguished female friend of the bride’s family, now lead the way towards the altar from the vestry. The friends who have come with the wedding party follow next in succession. Then come the bridesmaids, each pairing with one of the bridegroomsmen, and taking his left arm, the principal bridesmaid and principal bridegroomsman walk last, to be nearest to the bride and bridegroom. The bridegroom, having offered his left arm to the bride, conducts her up the centre aisle of the church to the altar. The parties in advance file to the right and left of the altar, leaving the bride and bridegroom in the centre. THE bridegroom stands at the right hand of the bride. The father stands just behind her, so as to be in readiness to give her hand at the proper moment to the bridegroom. 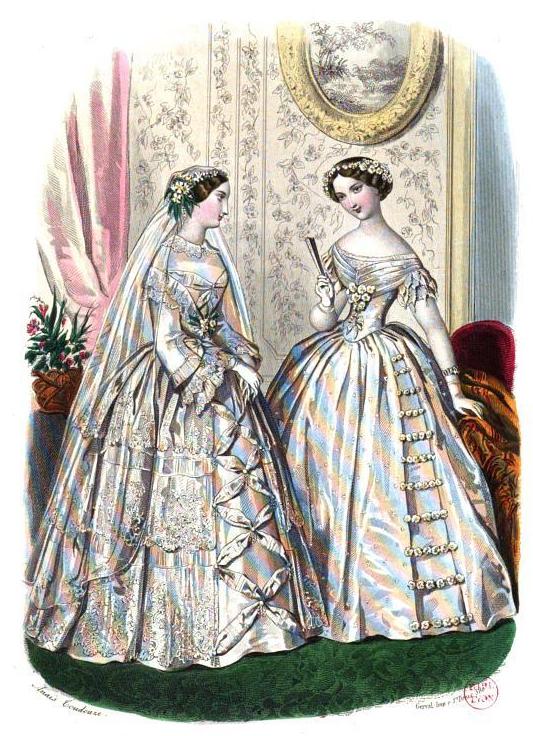 The principal bridesmaid stands on the left of the bride, ready to take off the bride’s glove, which she keeps as a perquisite and prize of her office. It was ordered by the old rubrics that the woman should have her hand covered when presented by father or friend to the priest for marriage, if she were a widow, one of the many points by which the church distinguished second marriages. A piece of silver and a piece of gold were also laid with the wedding-ring upon the priest’s book (where the cross would be on the cover), in token of dower to the wife. are to be pronounced distinctly and audibly by both parties, such being the all-important part of the ceremony as respects themselves; the public delivery before the priest, by the father, of his daughter to the bridegroom, being an evidence of his assent, the silence which follows the inquiry for “cause or just impediment” testifying that of society in general; and the “I will” being the declaration of the bride and bridegroom that they are voluntary parties to their holy union in marriage. must also be distinctly spoken by the bride. They constitute an essential part of the obligation and contract of matrimony on her part. 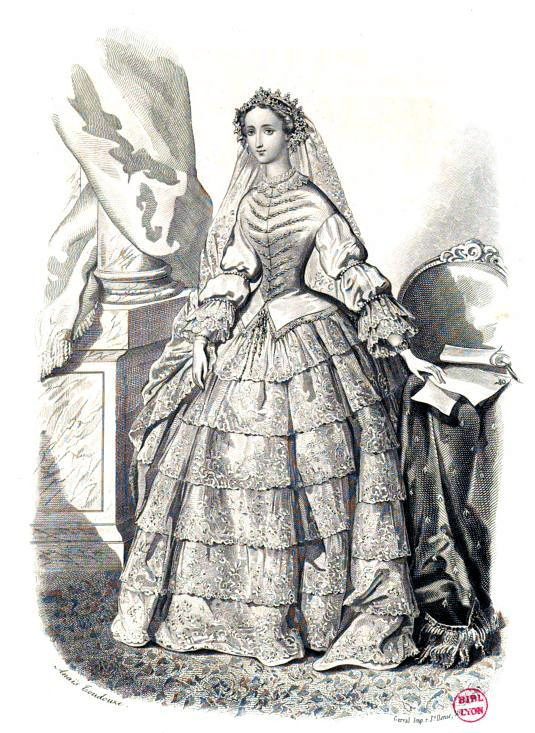 It may not be amiss to inform our fair readers that on the marriage of our Gracious Sovereign Queen Victoria to H.R.H. Prince Albert, her Majesty carefully and most judiciously emphasised these words, thereby intentionally manifesting that though a Queen in station, yet in her wedded and private life she sought no other right and privilege, and could assert no bolder claim than the humblest village matron in her dominions. THE rubric tells us “the man shall give unto the woman a ring, laying the same upon the book with the accustomed duty to the priest and clerk.” This is, however, not now done, it being usual to pay the fees in the vestry; but to insure the presence of the ring, a caution by no means unnecessary, and also in some measure to sanctify it, it is asked for by the clerk previous to the commencement of the ceremony, who advises it to he placed upon the book. 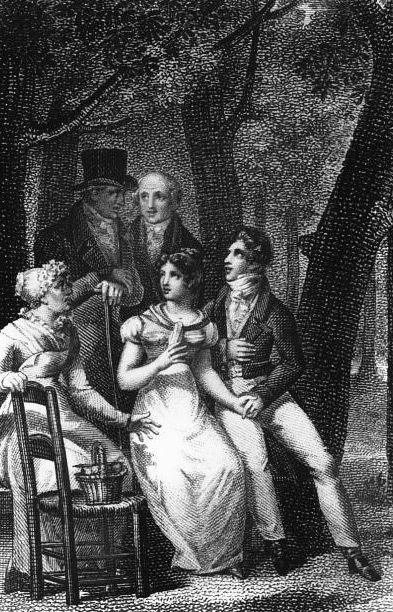 We pity the unfortunate bridegroom who at this moment cannot, by at once inserting his left hand (the one farthest from the bride) into the left-hand corner (the one most ready to his finger and thumb) of his right- hand (the right being the only hand he is supposed to have at liberty) waistcoat pocket, pull out the silver-paper enveloped ring. Imagine the not finding it there,—the first surprise, the immediate anxiety, as the right-hand pocket is rummaged,—the blank look, as he follows this by the discovery that his nether garments have no pockets whatsoever, not even a watch-fob, where it may lie perdue in a corner. Amid the suppressed giggle of the bridesmaid, the half-pitying, half-disconcerted look of the bride herself, at such a palpable carelessness and forgetfulness thus publicly proved before all her friends, on the part of her intended, and the hardly repressed disapprobation of the numerous circle around, he fumbles in coat pockets, and turns them inside-out ! No ring ! A further search causes great confusion and sympathy, until we have known it to go so far as the pulling off the bridegroom’s boots! lest the ring may have slipped down into one of them in his judicious efforts to place it in his waistcoat-pocket. In default of the ring, the wedding ring of the mother may be used; the application of the key of the church door is traditionary in this absurd dilemma; and in country churches a straw twisted into a circle has been known to supply the place of the orthodox hoop of gold. the clergyman usually shakes hands with the bride and bridegroom, and the bride’s father and mother, and a general congratulation ensues. THE clergyman of the church is invariably invited to attend, although the ceremony may be, in fact, performed by some friend of the bride or bridegroom. This is called “assisting ;” other clergymen who may attend in addition, as is sometimes the case, are said also to “assist.” But as much ridicule has fallen upon the custom, and the parties who have adopted it, and as the expression is considered an affectation, the fashion for its use has abated, and it is no longer usual to mention the names of any other clergymen than that of the one who performs the ceremony, and the clergyman of the church, who should be present, whether invited or not. It is, indeed, his duty to attend, and he must insist on so doing, inasmuch as the entry of the marriage in the parish register is supposed to be made under his sanction and authority. It should not be forgotten that the presence of an “assistant clergyman” entails the doubling of the fees. IN CASES OF DIFFERENT RELIGIONS. WHERE the bride and bridegroom are of different religions, the marriage is usually celebrated in the church of that communion to which the husband belongs ; the second celebration should immediately follow, and upon the same day. It is, however, regarded as more deferential to the bride’s feelings that the first ceremony should be performed in her own communion. There is a notion prevalent, that in the case of a marriage between Roman Catholics and Protestants, the ceremony must necessarily be first performed in a Protestant church. This is erroneous—the position of the marriage, whether first or last, is of no legal consequence, so long as it takes place on the same day. THE RETURN TO THE VESTRY. THE bride is led by the bridegroom. The bridesmaids and bridegroomsmen follow, the principals of each taking the lead. Then the father of the bride, followed by the father and mother of the bridegroom, and the rest of the company. THE REGISTRY OF THE MARRIAGE. THE husband signs first ; then the bride-wife, for the last time, in her maiden name ; then the father of the bride, and the mother, if present ; then the father and mother of the bridegroom, if present; then the bridesmaids and the bridegroomsmen ; then such of the rest of the company as may desire to be on the record as witnesses. All the names must be signed in full. The certificate of the marriage is handed to the bride, and should be preserved in her own possession, be her rank whatever it may. MEANW’HILE, outside the church, so soon as the ceremony is completed,—and not before, for it is regarded as unfortunate,——a box of the wedding favours is opened, and every servant in waiting takes care to pin one on the right side of his hat, while the coachmen, in addition, ornament the ears of their horses. Inside the church, the wedding favours are also distributed, and gay, indeed, and animated is the scene, as each bridesmaid pins on to the coat of each bridegroomsman a wedding favour which he returns by pinning one also on her shoulder. Every favour is carefully furnished with two pins for this purpose, and it is amazing to see the flutter, the smiling, and the very usual pricking of fingers, which this not unimportant duty of a wedding-bachelor and lady “in waiting” does occasion. THE bridegroom leads the bride out of the church, and the happy pair return to the house in the first carriage. The father and mother follow in the next. The rest stand not on the order of their going,” but follow in such order as they can best get out. ETIQUETTE OF THE WEDDING BREAKFAST. THE bride and bridegroom sit in the centre of the table, in front of the wedding-cake. The clergyman who performed the ceremony takes his place opposite to them. The top and bottom of the table are occupied by the father and mother of the bride. The principal bridesmaid sits to the left of the bride, and the principal bridegroomsman on the left of the bridegroom. It may not be unnecessary to say that it is customary for the ladies to wear their bonnets just as they came from the church. The bridesmaids cut the cake into small pieces, which are not eaten until the health of the bride is proposed. This is done by the principal old friend of the family of the bridegroom. The bridegroom returns thanks for the bride and for himself. The health of her parents is then proposed, and is followed by those of the principal personages present. After about two hours, the principal bridesmaid leads the bride out of the room as quietly as possible, so as not to disturb the party or attract attention. Shortly after -—it may be in ten minutes—the absence of the bride being noticed, the rest of the ladies retire. Then it is that the bridegroom has a few melancholy moments to bid adieu to his bachelor friends, and generally receives some hints on the subject in a short address from a bachelor friend, to which he is expected to respond. He himself now withdraws for a few moments, and returns, having made a slight addition to his toilet, in readiness for travelling. In some recent fashionable weddings we have noticed that the bride and bridegroom do not attend the wedding breakfast, but after a slight refreshment in a private apartment, take their departure immediately on the wedding tour. But this defalcation, if we may so call it, of the dramatis personœ of the day, though considered to be in good taste, is by no means universally approved, but is the rather regarded as a coxcombical dereliction from the ancient forms of hospitality, which are more due than ever on such an occasion as a marriage. THE young bride, divested of her bridal attire, and quietly costumed for the journey, now bids farewell to her bridesmaids and lady friends. Some natural tears spring to her gentle eyes as she takes a last look at the home she is now leaving. The servants venture to crowd to her with their humble though heartfelt congratulations ; and, finally, melting, she falls weeping on her mother’s bosom. A short cough is heard, as of someone summoning up resolution. It is her father. He dare not trust his voice; but holds out his hand, gives her one kiss, and then leads her, half turning back, down the stairs and through the hall, to the door, where he delivers her to her husband; who hands her quickly into the carriage, leaps in lightly after her, waves his hand to the party, who appear crowding to the windows, half smiles at the throng about the door, then gives the word, and they are off, and started on the voyage of life! The distribution of these is an important duty, which devolves on the bridesmaids, who meet for the purpose at the house of the bride’s father on the day after the wedding. The cards are two—the one having upon it the gentleman’s, and the other the lady’s name. They are furnished by the bridegroom, and printed to his order. They are placed in envelopes, sealed with white sealing-wax or silver wafers, and are all addressed some time before by the bridesmaids. The gentleman gives a list to the bridesmaids of such of his friends as he wishes to introduce to his home. This is a very important point, nor should such a list he made out without very grave consideration. 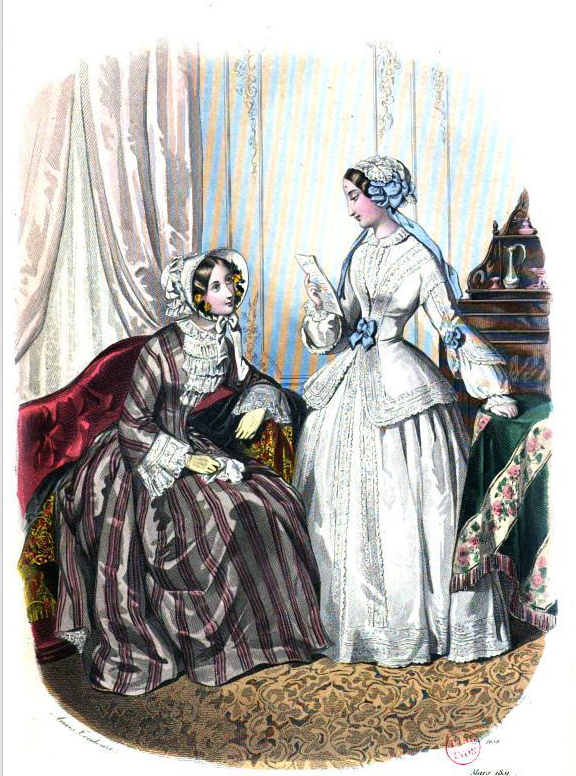 The lady generally sends cards to all whom she has been in the habit of receiving or visiting while at her father’s house. She also has thus an opportunity of dropping such acquaintanceships as she may not be desirous of continuing in her wedded life. This point of sending the cards is one requiring great care as well as circumspection, since an omission is an affront that sometimes endures through life. To those parties whose visiting acquaintance is wished to be kept up, on the bride’s card is written “ At home” on such a day. To send cards without an address is an intimation that the parties are not to call, except when they themselves reside, or the marriage has taken place, at a distance. In fact, the address is to denote the “At home ;” it is better, however, that the words should be put upon the cards. THE lady, at the proper period, retires to her apartment, and after having taken sufficient time for her evening toilette, directs the chambermaid to inform her husband that his apartments are ready. A HINT FOR THE HONEYMOON. THE honeymoon is often made uncomfortable (hear it, ye shuddering young Cupids !-—-an uncomfortable honeymoon !-——a warm winter and a cold summer are not more antagonistic to the truth of nature) by jealousy on the young husband’s part; for an expression that at another time would not be noticed, now—so carefully does he guard his newly acquired treasure—vexes and frets him, making him give way to potted expressions, which five minutes afterwards he will, by proper management on the lady’s part, be ashamed of and repent. The lady, then, in such an instance, should, instead of being irritated in her turn, or piqued, convince him, by her kind caresses, that she regrets having given him this trifling annoyance. Assuredly by such conduct the little quarrels that do ruffle some honeymoons might be escaped. We warn the lady to avoid the first quarrel, as the little temper shown on her husband’s part is only excess of fondness for herself. THE DRESS OF THE BRIDE IN THE HONEYMOON. SHOULD be characterized by modesty, simplicity, and neatness. 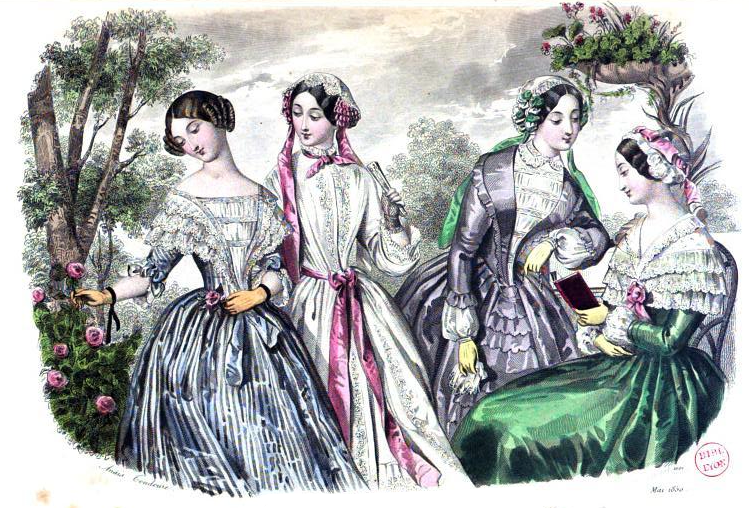 The slightest approach to slatternlines in costume, even a careless curl—not to say a visible curl-paper—would be an abomination, and assuredly stand in the future memory of the shuddering husband. 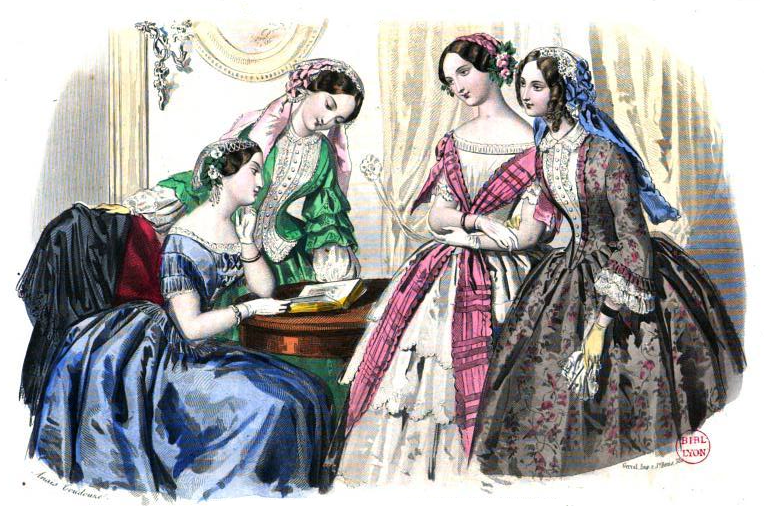 ABOUT a month or five weeks after the ceremony, the bride, in the company of her husband and her bridesmaids, sits “at home,” arrayed in her wedding dress, to receive the visits of those to whom cards have been sent. 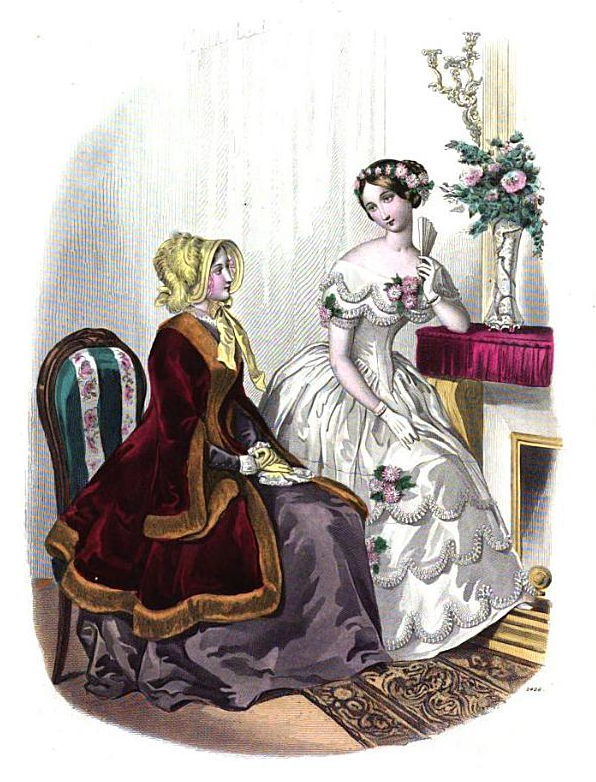 The bridesmaids assist the company to the wedding-cake and wine, in which each visitor drinks the health of the bride. These reception days are generally two or three in number. HOW A BRIDE SHOULD RECEIVE HER VISITORS. THE wedding visitors should be received with equal politeness and cordiality, but with no greater empressement in manner than visitors on an ordinary occasion. The lady should be easy, and perfectly at home. It is unnecessary to say more, as every lady knows how to receive her guests. THE bride and her husband, or, in case he may not be able to attend her, the principal bridesmaid, —the last of whose official duties this is—return all the visits paid to them on their reception days. Those who may have called on the bride without having received cards of her being “ at home,” should not have their visits returned, unless special reason exists to the contrary, such visit being an impolite intrusion. TERMINATION OF THE WEDDING CEREMONIES. THESE return visits having been paid, the happy pair drop their titles of bride and bridegroom, are for a short time styled the “ newly-married couple,” and then all goes on as if they had been married for twenty years. Good grief! Background checks, letters of recommendation, applications. Even Regency love matches felt like business. I have excerpted the saga of Polly and her Mr. Smith in letters from The London Universal Letter-Writer, Or Whole Art of Polite Correspondence published in 1809. Don’t worry, after much paperwork, there is a happily-ever-after. —Your affectionate blogger. p.s. The black and white images are from Le Conteur Des Dames. A young Lady to her Father. Honored Father, —MY duty teaches me to acquaint you, that a gentleman of this town, whose name is Smith, and by business a linen-draper, has made some overtures to my cousin Arnold, in the way of courtship to me. My cousin has brought him once or twice into my company, as he has a high opinion of him and his circumstances. He has been set up three years, possesses a very good business, and lives in credit and fashion. He is about twenty-seven years old, and is likely in his person. He seems not to want sense nor manners, and is come of a good family. He has broken his mind to me, and boasts how well he can maintain me; but I assure you, Sir, I have given him no encouragement, yet he resolves to persevere, and pretends extraordinary affection and esteem. I would not, Sir, by any means, omit to acquaint you with the beginning of an affair, that would shew a disobedience unworthy of your kind indulgence and affection. Pray give my humble duty to my honored mother, love to my brother and sister, and respects to all friends. I remain, your ever dutiful daughter. Dear Polly,—YOUR letter of the first instant has come safe to hand, wherein you acquaint me of the same proposals made to you, through your cousin’s recommendation, by one Mr. Smith. I hope, as you assure me, that you have given no encouragement to him; for I by no means approve of him for your husband. I have inquired of one of his townsmen, who knows him and his circumstances very well, and I am neither pleased with him nor his character. I wonder my cousin should so inconsiderately recommend him to you, though I doubt not his good intentions. I insist upon it, that you think nothing more of this matter, and your mother joins with me in the same advice. Adieu, my dear girl, and believe me—Your affectionate father. Dear Polly,—I HAVE received your letter of the first instant, relative to the addresses of Mr. Smith. I would advise you neither to encourage nor discourage his suit; for if on inquiry’ into his character and circumstances, I shall find they are answerable to your cousin’s good opinion of them, and his own assurances, I know not but his suit may be worthy of attention. However, my dear girl, consider that men are deceitful, and always put the best side outwards. It may, possibly, on the strict inquiry which the nature and importance of the case demands, come out far otherwise than it at present appears. Let me, therefore, advise you to act in this matter with great prudence, and that you make not yourself too cheap, for men are apt to slight what is too easily obtained. In the mean time he may be told, that you are entirely resolved to abide by my determination in an affair of this great importance. This will put him on applying to me, who, you need not doubt, will, in this case, as in all others, study your good.— Your mother gives her blessing to you, and joins in .the advice you receive from—Your affectionate father. Mr. Smith to the young Lady’s Father. Sir,—THOUGH personally unknown to you, take the liberty to declare the great value and affection I have for your amiable daughter, whom I have had the honor to see at my friend’s house. I should think myself entirely unworthy other favour, and of your approbation, it I should have thought of influencing her resolution, but in obedience to your pleasure; as I should, on such a supposition, other an injury likewise to that prudence in herself, which I flatter myself is not the least of her amiable perfections. If I might have the honor of your countenance, Sir, on this occasion I would open myself and circumstances to you in that frank and honest manner, which should convince you of the sincerity of my affection for your daughter, and at the same time of the honorableness of my intentions. In the mean time, I will in general say, that I have been set up in my business, in the line-drapery way, upwards of three years; that I have a very good trade for the time; and that I had a thousand pounds to begin with, which I have improved to fifteen hundred, as I am ready to make appear to your satisfaction; that I am descended of a creditable family, have done nothing to stain my character, and that my trade is still further improvable, as I shall, l hope, enlarge my capital. This, Sir, I thought but honest and fair to acquaint you with, that you might know something of a person who sues you for your countenance, and that of your good lady, in an affair that I hope may one day prove the greatest happiness of my life, as it must be, it I can be blessed with that and your daughter‘s approbation. In hopes of which, and the favour of a line, I take the liberty to subscribe myself, good Sir—Your most obedient humble servant. From the cousin to the Parents of the young Lady. Dear Cousin, —THE pleasure of having cousin Polly so long with us, demands my thanks to you both. She has entirely captivated a friend of mine, Mr. Smith, a linen-draper of this town. I would have acquainted you with it myself, but I advised cousin Polly to write to you about it; for I would not, for the world, any thing of this sort should be carried on unknown to you, at my house especially. Mr. Smith has shown me his letter to you, and I believe every tittle of it to be true; and really, if you and my cousin approve of it, and also cousin Polly, I do not know where she can do better. I am sure I should think so had I a daughter he could love. Thus much I thought myself obliged to say and shall conclude with my kind love to you all, and remain—Your affectionate cousin. The Father, in Answer to Mr. Smith. Sir,—I AM much obliged to you for the favour of your letter, as also for the good opinion you express in behalf of my daughter; but I think she is yet full young enough to alter her condition, and embark in the cares of a family. I cannot but say, that the account you give of yourself, and your application to me, rather than first to try to engage the affections of my daughter, carry a. very honorable appearance, and such us must be to the advantage of your character. As to your beginning, Sir, that is not to be so much looked upon as the improvement, and I doubt not but you can make proof of what you assert on this Occasion.— Still I must needs say, that I think, and so does her mother, that it is too early to incumber her with the cares of the world. As I am sure she will do nothing in so important an affair without our advice, so I would not for the world in a case so nearly concerning her and her future welfare, constrain her in the least. I intend shortly to send for her home, for she has been longer absent from us than we intended, and then I shall consult her inclinations. You will excuse me when I say, (for she is my daughter and a very good child) that I shall then determine myself by that, and by what shall appear to offer most for her good. I am, Sir, your friend and humble servant. Mr. Smith to the young Lady, after her return home. Dear Lady,—IT is with great pleasure I hear of your safe arrival at your father‘s house, of which I take the liberty to congratulate your good parents, as well as your dear self. I will not, Ma’am fill this letter with the regret I had to part with you, because I have no reason to merit, at present, to expect that you should be concerned for me on that account. However, I am not without hope, from the sincerity of my affection for you, and the honesty of my intentions, to deserve, in time, those regards which I cannot at present flatter myself with. As your good father, in his kind letter to me, assured me that he should consult your inclinations, and determine by them, I should humbly hope to pay you and him a visit. I think, far different from many in the world, that a deception in an affair of this weighty nature, should be less forgiven than in any other. Since then, dearest lady, I build my hopes more on the truth of my affection for you, and the honor of my intentions, than on any other merit or pretensions, I hope you will condescend, if not to become an advocate for rue, which would be too great a presumption to expect, yet to let your good parents know, that you have no aversion to the person and addresses of, dearest Ma’am—Your most affectionate humble servant. Sir,—THE letter you favoured me with I am happy to find my parents no less satisfied with than myself. Reserve, which is always disagreeable to generous minds, seems now unnecessary between us. My father is perfectly satisfied with the truth of every thing you have advanced, and I shall be obedient to his will. As soon as your business will permit of your absence from home, you will be welcomely received by my parents, as well as by—Your friend for life.